What happens when you add a healthy drink to a healthy drink? You get a smoothie with green tea in it. If you mix that miraculous drink with a bit of ginger and avocado, you are left with a smoothie that will knock your socks off and leave you wondering why everyone in the world doesn’t drink smoothies. 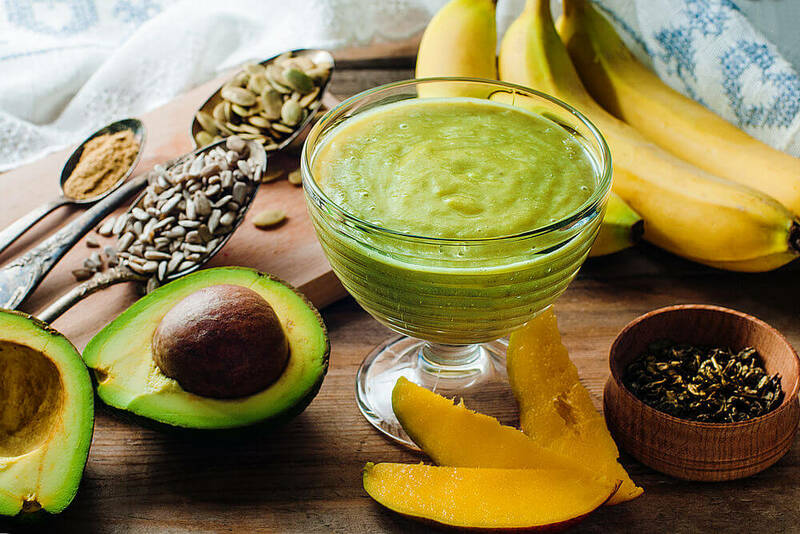 So get your blender ready because this is one of those life changing smoothies that deserves your full attention. The banana and mango will provide your taste buds with something to smile about but your body will thank you for the green tea. It is often called the healthiest drink on the planet and for good reason. This particular smoothie is a breakfast smoothie and one of the reasons is because of the green tea. Green tea contains just enough caffeine to wake you up without giving you “brain fog” or overstimulating the brain. Caffeine also blocks something in the brain called adenosine, which will in turn increase the firing of neurons and improve your overall concentration. It also has an amino acid called L-theanine, which can increase activity in the brain and has anti-anxiety effects. If green tea can make me smarter and happier, I’m in! Green tea has also been linked with a lower risk of many types of cancer. While researchers are still learning about cancer every day, it is known that toxins and free radicals in our body often lead to the development of cancer cells. Green tea is packed full of powerful antioxidants that may be able to lower your overall risk of several cancers. A study found that women who drank more green tea than most other women had a 22% lower risk of developing breast cancer. A similar study found that men who enjoyed more green tea on average had a 48% less chance of developing prostate cancer. Overall, green tea can have a positive effect on just about every part of your body. While it has not been scientifically proven, green tea is often added to weight loss supplements as it is believed to help you lose a few extra pounds. It has also been shown in early studies to reduce the risk of cardiovascular diseases, including stroke and heart disease. A Japanese study found that green tea can lessen a person’s risk of developing type II diabetes by 42%. Green tea is a great way to add a unique flavor profile to your smoothie while also taking care of your body from the inside out. 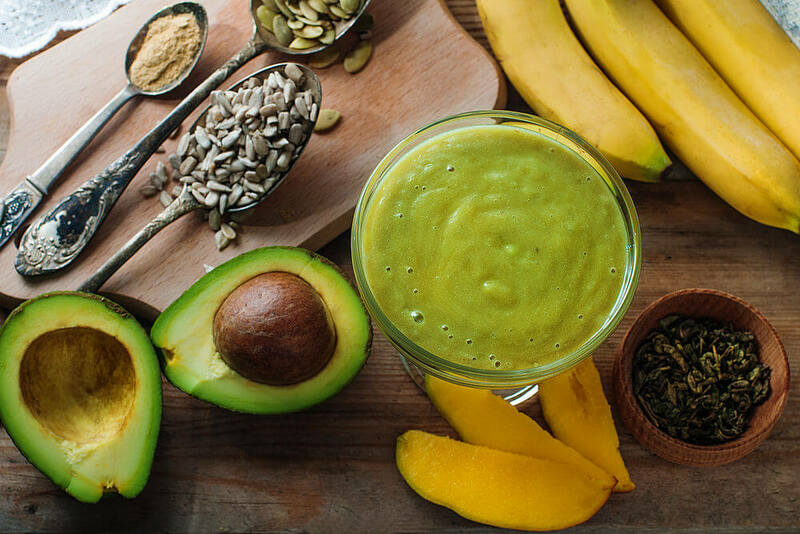 When added to a smoothie, avocados add a richness that just can’t be beat. But besides improving the texture of your smoothie, avocados also offer your body nearly 20 vitamins and minerals. They are an excellent source of B vitamins, which are necessary to fight infections. They are also full of fiber, which helps this breakfast smoothie keep you fuller for longer. No mid-morning snack will be needed! I’m sure that you’ve heard that avocados are high in fat but it’s the “good” type of fat that your body needs. Ginger adds a great flavor to this smoothie. If you’re anything like me, adding ginger to any recipe changes the entire taste in such a positive way. I try to add ginger anytime that I can, both for its taste and health benefits. It can help to sooth an upset stomach and is often recommended for morning sickness. It is also know for its ability to decrease inflammation and has been shown to reduce pain associated with arthritis. Fresh ginger is always best. You can grate it as needed for your smoothie and even add a little extra on top like I do. If you are unable to use fresh ginger, a packaged version will work but will not have the same strength of flavor and health benefits. Bananas have a long list of health benefits. They are a natural antacid and can help to prevent or relieve heartburn. They also help the body absorb calcium, which is critical for strong bones. Bananas also help to keep your digestive tract happy and healthy. Anytime that I can add mango to a smoothie, I jump at the chance. They contain a good amount of natural sugar and make smoothies taste much sweeter. They contain Beta-carotene, vitamin E and potassium, which are all needed to maintain a healthy heart. Mangoes also help to control your blood pressure. Most people only munch on pumpkin seeds once a year but they are actually great anytime. They have a wide variety of nutrients, including magnesium, protein and zinc. Zinc offers immune support while magnesium has been shown to prevent dangerous heart conditions. Sunflower seeds might come as a bit of a surprise when glancing over smoothie ingredients but these well known seeds aren’t just for eating alone on a summer day. They help to control cell damage and have been linked to preventing certain types of cancer. They also have magnesium, just like the pumpkin seeds. Magnesium is soothing for the nerves and can help relieve stress.